​Mix and match DNA from distinctly South-African species to create the ultimate animal. Collect all the strands to experiment with a nearly endless range of possibilities... and fight for survival! AAAAAAAAAH!! - ​2 Game Controllers REQUIRED. 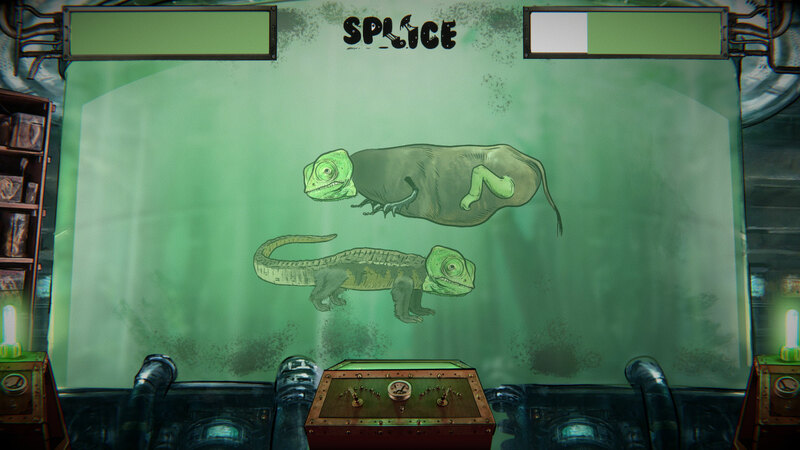 Splice DNA together to create a killing machine and verse off against your friends in this splitscreen fighter. We're opting for the 72 hour jam since we'd like to keep working on it to make it more enjoyable but here is some progress for now. Pretty funny resulting combinations in the creatures. The controls in the beginning were quite sticky and struggled to accept or move to the selection around, using Xbox controllers. I can totally see some cool progression system in this as you morph the creatures with the potions, I found the combat uninteresting, not much going on there. The gritty textures are great, got the underground lab mood going there. It was a little uncomfortable when the creatures fight at the top, almost like the camera forgot to look up at the action. My favorite mashup is chameleon head with giraffe legs, and mantis arms? It looks completely ridiculous. I really wanted to try out this game, the art looks great and the premise is interesting. But I don't have a controller available at the moment. Why did you decide to make it controller specific? A piece of advice I received a while ago that I try to live by now is that the easier it is for people to play your game, the more likely they are to. Mouse and keyboard are a must. Web builds a definite plus. Anyway, well done on the entry, and if you ever update it with new controls, I'll be keen to try.